Cadmium is a toxic metal for living organisms. It causes abnormal fetus development, cancer, DNA mutations; it impairs growth, and compromises the functions of the reproductive, respiratory and endocrine systems. Cadmium enters the aquatic system through industrial activities such as smelting and the manufacturing of batteries, paints and plastic stabilizers. It accumulates in living organisms, especially freshwater organisms like fish and amphibians. Since cadmium is not biodegradable it damages the tissues and impairs physiological processes even at low concentrations. For this reason, the European Community (1998) established acceptable freshwater safety levels for cadmium i.e. 5 µg/L in drinking water and 20 µg/L in sewage waters. In our study we found that even these low cadmium concentrations affected the newt Triturus carnifex, an urodele amphibian spending most of its life in water. It is highly sensitive to aquatic pollutants and the species’ naked skin offers no protection from waterborne chemicals. These features make this newt an ideal bioindicator of environmental contamination. 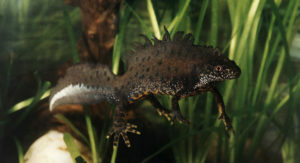 The Italian crested newt (Triturus carnifex). In our previous study (2013) we exposed two groups of newts to the European cadmium levels of 5 µg/L and 20 µg/L, respectively, for 3 months, and two groups of newts to 5 µg/L and 20 µg/L, respectively, for 9 months. Cadmium exposure disrupted the endocrine system playing a key role in the physiology and survival of the newt. On the grounds of these results, we verified if the same exposure to cadmium could induce 1) cadmium accumulation in the newt 2) damage to the skin, the first biological barrier against chemical and physical pollutants and deficiencies in the liver and kidneys that are the primary organs for cadmium accumulation 3) apoptosis, a programmed cellular suicide considered an indicator of chronic chemical stress 4) the increase of metallothioneins, a family of proteins binding metals and involved in metal detoxication. In our study, the newts were exposed to both 5 µg/L and 20 µg/L of cadmium for the 3 and 9 month period, whereas other newts, serving as the control group, were only exposed to tap water so as to compare the results obtained. The results showed that even at these low doses, cadmium altered the physiology of the newt. Firstly, T. carnifex accumulated the metal in its tissues after the 9-month exposure period. Curiously, a similar but lower accumulation was also found in the control group not exposed to cadmium. Further analysis revealed that the cow liver, used to feed the newts, contained small amounts of cadmium. Therefore our newts had not only absorbed cadmium through the skin, but also via the oral route which represented only a small part of the total accumulation. The control group absorbed the cadmium only with the consumption of cow liver. There were also changes in the skin which appeared thinner and keratinized while the liver and kidneys manifested signs of toxicity and cellular degeneration. Moreover, the kidney also showed apoptosis, indicating that the kidneys were the most damaged organs. Metallothioneins did not increase. Our study demonstrates that cadmium is a real risk to amphibians at risk of extinction. In addition to cadmium accumulation, the newts suffered alterations in basic tissues like the skin involved in the physiological exchange of respiratory gases, ions and water. Changes were also detected in the liver and kidneys, involved in the digestion and excretion of cellular metabolic products, respectively, and also implicated in the detoxification processes. Together with the impairment of the endocrine system, previously indicated, our study demonstrates that the current freshwater safety levels for cadmium are not safe for amphibians, and raises doubts about the safety of these levels for humans. Histological changes, apoptosis and metallothionein levels in Triturus carnifex (Amphibia, Urodela) exposed to environmental cadmium concentrations. Capaldo A, Gay F, Scudiero R, Trinchella F, Caputo I, Lepretti M, Marabotti A, Esposito C, Laforgia V.